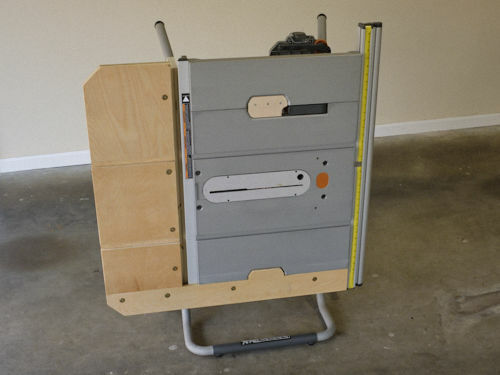 This extension table for my Ridgid R4510 portable table saw is not my design. I stumbled across it on Pinterest and built it from the plans at Stonehavenlife.com. It extends the depth of the saw’s table by 12”, eliminating the need for a separate outfeed support for many cuts (rip cuts of less than 34”). 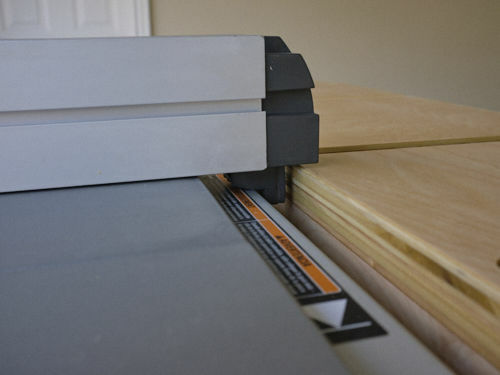 It supports my crosscut sled, allowing me to use it without using a roller stand for support. It doesn’t require any permanent modifications to the saw. It’s clamped onto the saw and is easily removable. There’s some really very clever engineering behind this extension table. It leverages the saw’s cord wrap studs and tabletop handle cutouts. The main support element (which the designer calls the bridge) is a back plate that rests on the cord wrap studs, held in place by hose clamps. The bridge is secured to the table’s body by a support arm whose front end grabs the handle cutout on the tabletop’s right side. The support arm also has an ingenious tilt mechanism composed of two bolts on the back end, one of which acts as a fulcrum, the other as a tensioner. A thick support beam bolts to the top of the bridge, and the rear extension table surface is bolted to it. The bridge bolt holes in the beam are slightly oversized and allow just enough vertical movement to accurately align the extension table with the tabletop. 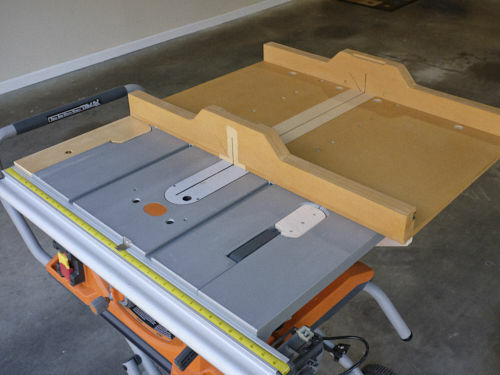 A narrow side extension table is bolted to the rear extension and clamps to the tabletop’s left side with a cleat that wraps around the tabletop’s bottom edge. It prevents the rear extension from tilting. The whole thing feels very solid and secure. Sadly, this design won’t work as-is with the newer Ridgid R4513 saw that replaced the R4510 because the newer saw doesn’t have the handle cutouts. See the designer’s web site for more details. As I mentioned earlier, the extension table supports my rather large crosscut sled. 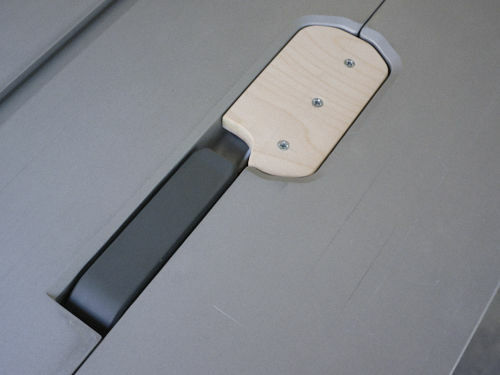 The support arm cap has a cutout to enable easy access to the saw’s extension lever. The support beam sits below the fence’s locking mechanism, with the extension table behind it, enabling the fence to move without interference. Here’s what it looks like with the saw collapsed for storage. This looks like a very nice and practical improvement and very well done too. Ron, thanks for posting this project it looks great on your saw. I may just have to put one on my Ridgid as well. Thanks for the comments. The designer did a really nice job. So clever idea!! I have similar problem with my Metabo TS254. Thanks for great idea.